Water and wood floors don’t mix. 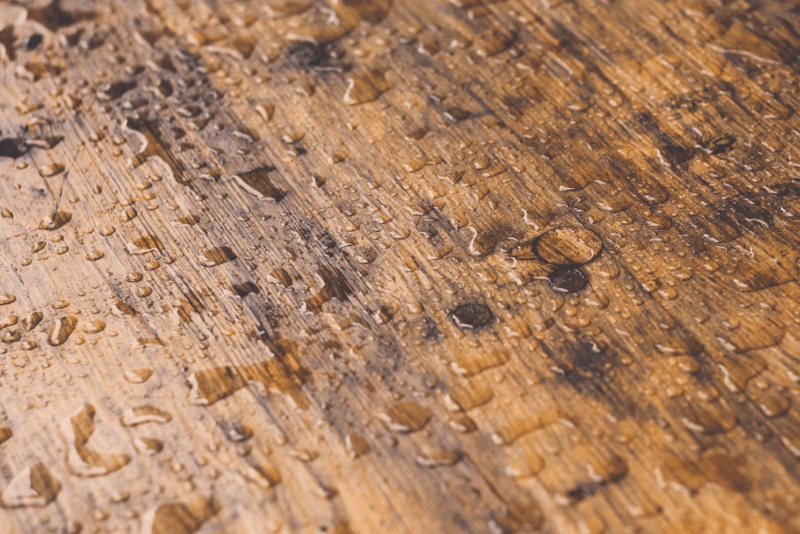 If you’ve got standing water on wood floors, you’ll need to act quickly to avoid further damage and dangerous mold and mildew growth. Wood floors are rarely the same after significant water damage, but you can reduce repair costs with a few simple steps and a little elbow grease. Special note: Flood waters can be riddled with dangerous pathogens, dirt, and organic matter that may cause irritation or illness. If the flood water source is unknown or the result of a sewer backup, you’ll need to call a expert water restoration team to avoid potential exposure. Wood floors have several permeable access points: between seams, breaks in top coating, under baseboards, and through heating registers. When wood gets wet it swells and cupping can set in. Cupping is easy to spot: the sides of the boards will bow above the center. In many cases, cupping is a sign that flooring will require replacement. Your immediate response should be to remove as much standing water as possible, and then eliminate any dirt left behind. A shop vacuum is ideal for this job. Depending on the size of the area and what’s available, towels, mops, and squeegees may also be helpful. Once a majority of the water has been cleaned from the floors, baseboards, and other woodwork, vigorously scrub the same areas with a dry brush or broom to loosen any dirt or debris that remains. Next, the wood floors have to be cleaned and sanitized before the drying process can begin. There are several safe detergents to pick from; TSP All Purpose Heavy Duty Cleaner is inexpensive and available on amazon.com and at all home improvement stores. Avoid soap-based (sudsy) cleaners, wax, or steam cleaners to disinfect your hardwood floors. Mix your preferred detergent according to package directions. Wash the floor in sections to avoid further water damage. Apply the detergent mixture to all affected areas. Use the shop vacuum to remove residual water as you go. Even after all standing water has been removed, there’s still plenty of moisture left to cause damage. You’ll need a professional-grade dehumidifier to begin the drying process—a personal use dehumidifier will not suffice. Most people don’t have a large dehumidifier on hand, so you’ll more than likely have to call around to rent this critical piece of equipment. Arrange the dehumidifier in the center of the affected area; leave it running undisturbed for at least 24 hours. To aid this process, arrange several large fans to encourage air flow. Direct the fans toward the floor—move them around as needed. If you have central AC, it won’t hurt to turn that on as well. Depending on the weather outside, open the windows. Remember, the purpose of this step is to dehumidify. So, if humidity is high outside, open windows just a few inches. The drying process can take weeks, depending on several factors. The only way to know it’s completely dry is to buy a moisture meter and test the affected areas. There are several moisture meters available on amazon.com. Fixing water-damaged hardwood floors is no small task—every second counts, and hesitant homeowners may find the do-it-yourself approach too time consuming or daunting. Moreover, if the water source is unknown or the result of a sewage backup, do not attempt to mitigate the water on your own. Flood waters may contain dangerous pathogens, bacteria, and organic matter. Instead, call an accredited restoration company to ensure a safe and thorough cleanup. If you’re unable to successfully mitigate water damage on hardwood floors, you may need professional assistance removing damaged flooring, mitigating mold and mildew, and restoring your property to like-new condition. The team at Water Damage Denver has been in business for 25 years and proud to serve residential and commercial property owners in and around the Denver Metro area. Call us 24 hours a day, seven days a week for immediate relief and emergency water damage services.